Welcome to another week of the Love to Learn Linky! This week – we’re all about DOING playful hands-on MATH with young children. We have ideas to help kids learn about numbers, measurement, geometry, patterning, and data management (graphing!) – all in a fun HANDS-ON way. Because that’s how kids learn math best when they’re young – through PLAY! It’s helpful as a parent to know what these areas are so that you can make sure that you’re helping expose your child to each of them in day to day life and play. Number Sense and Numeration – includes all the understandings of place value, as well as addition, subtraction, multiplication, division, decimals etc. Measurement – focuses on the concepts of length, width, distance, time, weight and mass, capacity and volume, temperature etc. 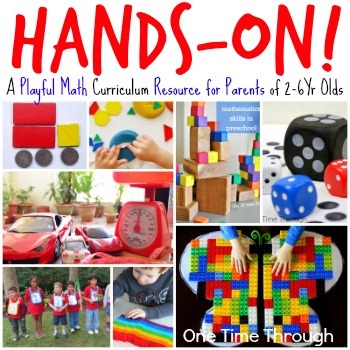 What IS Playful Hands-On Math? Young children should begin to develop these mathematical understandings at their own pace through repeated and authentic experiences as much as possible – and this often means through their PLAY! Having young children memorize flashcards of facts, or even relying too much on paper-based mathematical activities, robs them of the chance to truly see math as a THINKING and PROBLEM SOLVING activity. One where there are many ways to get to an answer and many ways to view a problem. It may also have the unintended side-effect of robbing them of the JOY of learning to think mathematically. We all know too many people who say they hated math in school and still do. The activities I’ve gathered today are grouped under the 5 strands I mentioned above and are all hands-on ways to get young children to have FUN while learning to THINK mathematically. For each strand, I have included a list of concepts that children aged 2 to 6 can be exposed to which will help them develop beginning math skills. I’ve also included examples of activities that can be used to support each concept. Snowman Math from Sugar Aunts. A Maze of Numbers: Counting Activity from Hands On As We Grow. Classroom Tunics from Little Fingers Big Art. Bottle Cap Learning from Tiny Tots Adventures (shown above). Learn about different standard measurement tools such as thermometers, clocks, weight scales, balances, rulers, measuring cups, etc. Baking with Kids, Growing Seeds, and Indoor Snow Play from One Time Through. Kinetic Sand Math from Left Brain Craft Brain. 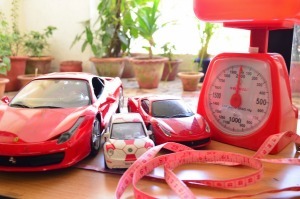 Weights Lengths and Shapes Math Activities from The Practical Mom (shown above). 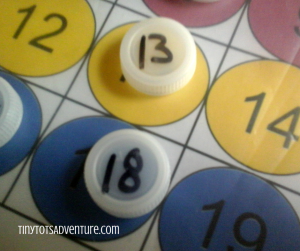 Recycled Craft Measurement & Counting Game from Artsy Momma. 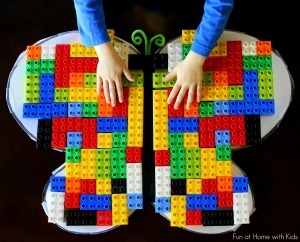 Lego Symmetry from Fun At Home With Kids (shown above). Indoor Snowball Structures from One Time Through. Pattern Blocks and Playdough from Munchkins and Moms. Kids Quilt Activity from Buggy and Buddy. Mathematical Skills Block Stacking from Stay At Home Educator. Make a Truck from Shapes from Powerful Mothering. Symmetrical Patterns with Natural Materials from The Imagination Tree. Egg Shaker Music Games from One Time Through. Snacktime Math from Coffee Cups and Crayons. 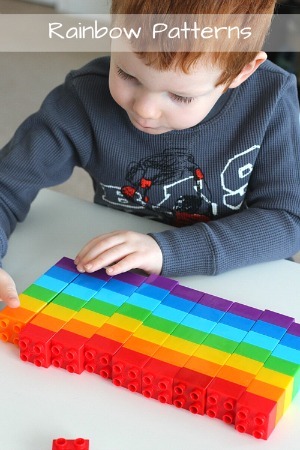 Rainbow Patterns with Blocks from Mom Inspired Life (shown above). Sort and Count Rainbow Busy Bag from Powerful Mothering. 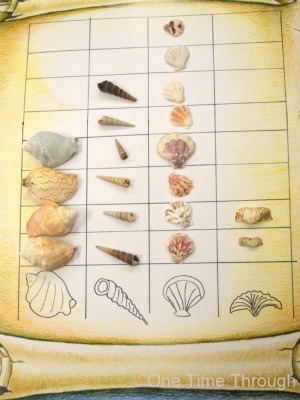 Ocean Shells Craft and Graphing from One Time Through (shown above). Lego Graphing from J Daniel 4’s Mom. Muffin Tin Color Sorting from Modern Preschool. Simple Graphing from Teach Preschool. 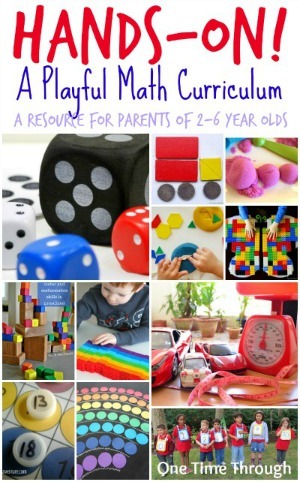 Hope you found some fun and playful hands-on math activities for your 2 to 6 year old today. And if you don’t want to miss out on any more of the fun we have here at One Time Through, sign up for our NEWSLETTER today. Find out more on our Subscribe Here page! Ideas for this curriculum were compiled and adapted from these resources: The ELECT document for Early Childhood Settings in Ontario, Elementary and Middle School Mathematics: Teaching Developmentally by John A. Van De Walle, and About Teaching Mathematics, Grades K-8: A K-8 Resource by Marilyn Burns. What a great resource! So many amazing math ideas. Definitely filing this one away as a reference. Thanks Anne – I wanted to gather ideas that I could keep coming back to with my son before Kindergarten. Hope you find it helpful! Great Swapna! Thanks for dropping by.